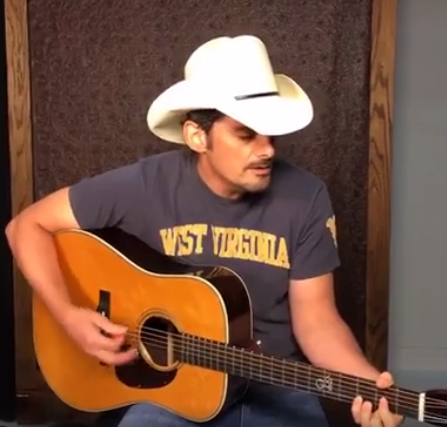 Brad Paisley is requesting donations totaling $1 million to help those in his home state of West Virginia who have been affected by flooding. On June 23, floods killed more than 10 people and damaged numerous homes and businesses. Three counties in the state have been declared federal disaster areas, and 44 of the 55 counties have been declared in a state of emergency. Paisley himself made an initial donation of $100,000. “Now that the waters are receding it’s time to pitch in and help in any way we can. One of the best ways I have found that hopefully will raise the largest amount of money the quickest and get it to the people in need the fastest is through GoFundMe. I have set a goal of $1 million—this is doable and only a small portion of what is needed. Join me as we help West Virginians together,” said Paisley. The GoFundMe account will be distributed by West Virginia Flood Relief 2016 – The Brad Paisley Foundation at WESBANCO Trust Department in Wheeling, West Virginia. To donate, visit gofundme.com.